Image: a combined lamp, with a normal lightbulb and three LEDs. Its possible to use the normal light which is much brighter, if necessary, and save a lot of energy all the other time. The newest development in light sources are white LEDs. A LED or Light Emitting Diode is a rather simple semiconductor circuit which emitts light without producing waste heat. This means, it needs only very little energy, about 5% of a normal light bulb to produce the same amount of light. Our belief is, that in 20 years there will be no more bulbs in our daily life, they will be replaced by LED energy saving lamps. So why don't we already have those phantastic lamps? Of course, there are still some drawbacks, as with any new technology. The most important: LEDs are still very expensive. Cavers were among the first to use this lamps. There are two simple explanations. 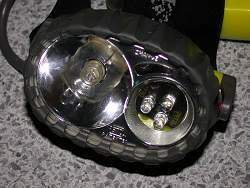 First cavers are able to handle the still lower brightness, compared to other light sources. They stay for hours in the caves and the eyes have time to adapt to the low light. And second, the extremely long burn time, or the other way round: the very low amount of batteries needed reduced the weight of the cavers baggage, and increases security. And probably a last detail: those lamps are still rather expensive, but cavers are often willing to pay for a good value. So this lamps are already rather common among cavers. If you want to see those lamps in daily life, there are already many products where they are used. Several countries use them as save lights for signs in tunnels, for example in the Tauerntunnel in Austria, they are used to mark the side of the road. Some car manufaturers use them for back lights, and most likely it will not be necessary to repair them during the lifetime of the car. Unlike normal bulbs their life span is much longer than that of the car. Search Google for "LED light"
The LED Light, Inc (Carson City, NV, USA) sell any kind of LED light including some suitable for caving. The Perfect LED Light by Garry Petrie. A lengthy article about how to build the perfect caving LED light.